No power at your job site? No Internet? No Problem!! iBEAM power and communication options get your cameras up and running quickly. All iBEAM cameras are backed by our outstanding support, lifetime warranty and 30-day money back guarantee. Provide power to your camera with an iBEAM solar kit. 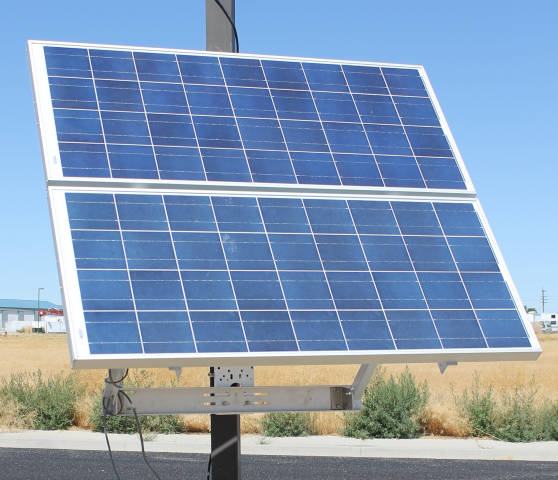 Each kit contains photovoltaic (solar) panels, mounting brackets, batteries, charger controller, and lockable outdoor-rated battery enclosure. Kits are pre-wired for easy installation. iBEAM solar kits provide continuous power to your camera. Solar kit sizing is based on the location of your project and the type of camera you are using. iBEAM solar kits are engineered to provide at least 2 days of autonomous power to your camera under sunless conditions. To help ensure optimum results, iBEAM sizes your solar power kit based on the location of your project. Save 30% on iBEAM solar kits with the federal Business Energy Investment Tax Credit. The iBEAM 12V Battery Power Kit is a rechargeable 12V power source for iBEAM Time-Lapse Pro and OnSite Fixed cameras. Depending on camera model and temperature at the job site, you can expect the 12V Power Kit to provide continuous power to your camera for 48-72 hours. For uninterrupted power, each kit includes two batteries -- one to power the camera while the second is charging. iBEAM carries a full line of camera accessories, including non-pentrating roof mounts and extreme weather enclosures. Call us at 800.403.0688 for more details. © 2001-2019 iBEAM Systems, Inc. All rights reserved.